This post originally appeared on WRI Insights. Indore’s new iBus now carries more than 23,000 passengers daily. Photo by EMBARQ India. Indore, India—nicknamed “Mini Bombay”—is a booming city of two million people. The city’s rapidly growing population has created serious problems, including increased road congestion, travel delays, traffic accidents, and environmental degradation. Enter the “iBus.” Indore’s new Bus Rapid Transit (BRT) line—the iBus—recently completed 100 days of passenger operations. The new system carries more than 23,000 passengers per day, easing congestion, reducing travel times, and creating a safe, convenient mode of public transport. Many factors contributed to iBus’s success in Indore. One, however, stands out as a lesson for all transit stakeholders: the importance of public outreach. The iBus has seen impressive results in its first few months in operation, but it wasn’t always smooth sailing. When construction of the iBus first began in 2007, the general public reaction ranged from strong opposition to enthusiastic support. A host of factors affected public and press opinion: construction delays, little public engagement, and lack of faith in the political and administrative leadership of the city. The iBus is a great example of the power of public outreach and involvement. Developers knew that making the iBus a success meant improving its mixed reputation. To do so, they relied on four critical branding and public outreach activities to generate a “buzz” around the project: crowdsourcing, education campaigns, social media, and trial runs. To involve the people of Indore, the Atal Indore City Transport Services (AICTSL) held a contest in August 2012 to name the new BRT. From amidst the many entries received, the name “iBus” was chosen. The “i” signifies “intelligent” as well as “Indore,” creating a sense of belonging. The name was easy to remember and pronounce. The sense of ownership it created fostered local pride in the new BRT service. AICTSL and EMBARQ India, part of WRI’s EMBARQ Center for Sustainable Transport, then partnered to create a brand logo that would communicate the iBus’s values of speed and reliability. The entire exercise in selecting a design also reflected back on AICTSL, portraying it as a company that manages a modern, efficient, safe BRT like the iBus. Even as construction was underway, local media reacted negatively and sometimes with skepticism towards the BRT project. To ensure that media had access to the most accurate information about the iBus and its vision, Dario Hidalgo, EMBARQ’s director of research and practice, led a Focus Group Seminar with senior journalists from Indore. Citing examples from across the world, this seminar was able to address a number of myths and misperceptions related to BRT systems and the iBus. EMBARQ India staff also supported AICTSL in holding Public Focus Group Sessions with students and young professionals. In these sessions, audiences were informed about what the iBus was, how it would run, and how it would benefit them. Groups were taken on tours of the corridor, accompanied by journalists and other observers. For example, in April 2013, about 30 journalists went on a study tour of the Ahmedabad Janmarg BRTS – a recognized success for BRTs in India. 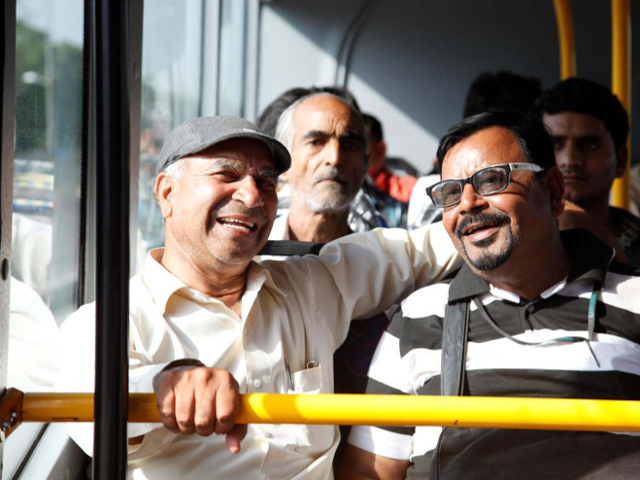 Experiencing and learning about a full-fledged system that carries more than 140,000 riders daily—and set in a context similar to Indore—allowed participants to better visualize the plans for the iBus. Outreach sessions eventually reached more than 1,200 people, helping to dispel myths around the project and build a sense of comfort with the upcoming service. Recognizing that Indore needed an open, public dialogue to create a transparent image of the iBus, EMBARQ helped AICTSL create an iBus Facebook page in March 2013. Because the BRT corridor runs adjacent to a large number of schools and universities, the Facebook page was seen as an opportunity to engage the youth and attract potential ridership. The Facebook page provided updates on construction, answered queries regarding service, and soon became an informal forum to take feedback and suggestions. During Public Focus Group Sessions, participants began “tagging” themselves to photos on the Facebook page. As the page’s number of “Likes” grew, the media began to pay attention, often referring to the page for project information and photographs. The use of social media has been tremendously rewarding in the case of Indore. Trial runs, sans passengers, began in April 2013 to ensure smooth running throughout the corridor while also creating an image for the system before operations began. Seeing buses run along the corridor was reassuring for the public and helped create an atmosphere of acceptance and anticipation. On May 10, 2013, free passenger trials of the iBus began. Not charging a fare was a strategic decision aimed at achieving greater ridership while helping everyone understand the system. Over the course of the five-week free passenger run, ridership went up significantly each week. With the launch of iBus, there are now seven BRT systems in India—and soon to be more. Bhopal, Surat, and Pimpri-Chinchwad are expected to launch their own advanced bus systems later this year, and five more cities have BRT lines under construction. An additional five have announced future plans to build such a system. In less than a decade, the number of BRT systems and bus corridors in India will have gone from zero to twenty. As these cities move forward with their own BRT systems, it’s important that they keep the lessons from the iBus in mind: Designing a BRT system is only half the battle. Communicating about the project is imperative to its success. LEARN MORE: Discover more about BRT systems on the EMBARQ website.